What’s the difference between a flyer and a leaflet? The design style, or ‘look & feel’ of your flyers is what really helps your flyer create visual impact and make potential customers pick it up. You can have an amazing business, service or product to promote, and your text content may be crafted to perfection – but if your flyer doesn’t look great from a stylistic point of view – then not many potential customers are going to pick it up and actually read your leaflet! Below you can see some creative samples of leaflet / flyer designs which have a strong sense of visual impact and utilise strong colours, bold graphics, distinctive styles and strong typography/fonts. The style of a flyer should be tailored to your target audience, and their are quite a few different styles below – but each one is designed to quickly get attention and make people want to pick it up and read. Bold graphics, fonts and vibrant colour can create impactful leaflet / flyer designs. This leaflet is for a soulful music event. This flyer to promote this fitness service the main, aspirational image of a women looking in good shape, appeals to those looking to get fit & healthy. This is complimented with a vibrant, female orientated colour palette and strong use of fonts. A really distinctive style can help a flyer stand out from the crowd. Simple graphic imagery of the hands on the front of this leaflet makes it catch your attention. Side 1 of the leaflet has minimal content to draw you in and pick it up, whereas the more detailed information is kept for side 2, to read once you have captured the readers attention. With over 15+ years commercial graphic design experience – I have designed a lot of leaflets/flyers in that time and won some awards, and a lot of my graphic design services are now specifically for the design and print of leaflets/flyers. 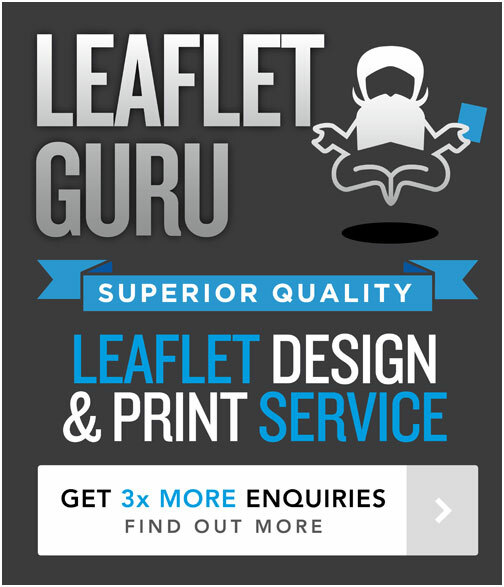 This is largely due to the success of my web-site over at www.leafletguru.co.uk (check it out after reading this post to see my full creative leaflet design portfolio and get some creative inspiration). I tend to get a lot of repeat customers now, which for me is very satisfying as I guess that implies that I provide a great leaflet/flyer design service and proves that I know a thing or two about designing a quality leaflet that stands out from the crowd and gets the results and creates the impact my clients need. I therefore thought I would share some of the knowledge I have gained in this specialised area in my blog to help in the understanding of how to create a great looking, engaging and effective leaflet/flyer that gets great results.